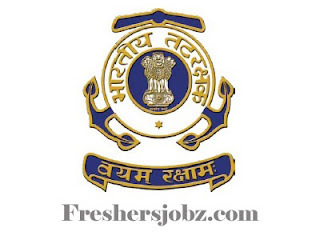 ICG Notification 2018.Indian Coast Guard has released a notification for the recruitment of male candidates for the post of Navik (Domestic Branch-Cook & Steward) 10th Entry - 01/ 2019 Batch.Check the eligiblity and notification prior to apply for the positions. Navik (Domestic Branch (Cook & Steward)) 10th Entry - 01/ 2019 Batch. Qualification: 10th Class with 50% marks in aggregate. Age: 18 to 22 years as on 01.04.2019. Selection Procedure: Based on written examination, physical fitness test, initial medical examination (preliminary). Online applications from: 15.10.2018 to 29.10.2018.